SPECIALS RATES ! Clean, quiet and comfortable overlooking gardens. DO YOU WANT TO KNOW WHAT SETS THIS ONE APART FROM THE OTHERS? Comfortable linens,, more pillows than you will ever know what to do with, absolutely stunning views of the grounds, quiet end unit away from road , comfortable furnishings, light and bright and oh so clean. 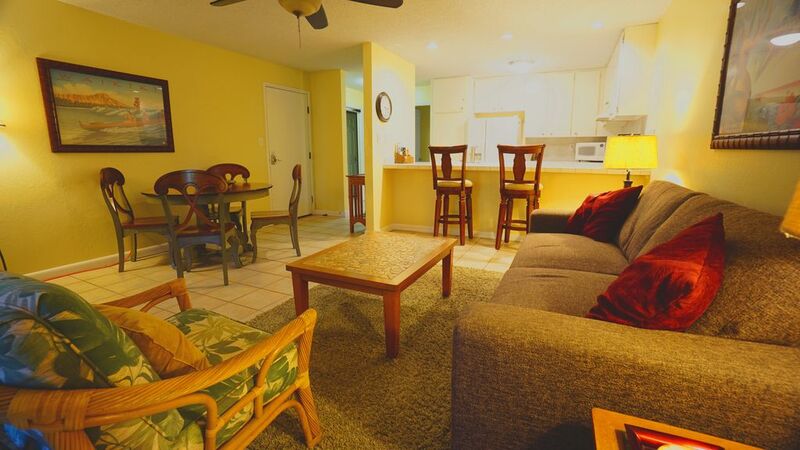 This condo is located in the back of the resort so it is nice and quiet! *MOST IMPORTANT*You will be ecstatic that you have chosen to stay here at Kihei Resort. We provide Laundry soap, dryer sheets, beach towels, coolers, beach chairs, umbrella, hair dryer, and SO MUCH MORE! You will be just as pleased as our guests that have returned year after year ! Always here to help you with questions. I promise to make your stay as clean,comfortable, and fun as possible! We enjoyed our stay very much. Hope to be back next March. Sorry to say having been in a couple other suites #120 needs updating but in the end a fridge is fridge whether it is stainless steel or not. Thanks for the king sized bed and love the shower head. Modest, clean and tidy, comfortable. We usually stay a little further south in Kihei but this was a last minute booking and we were lucky to find accommodation. The location turned out to be great for us, we move from beach to beach everyday and Kihei Resort was a great home base. The unit itself shares the kitschy charm that you expect from a Maui condo, not luxurious but comfortable and well appointed. We would definitely stay here again. We enjoyed our stay here the condo was well equipped and clean. It is a bit dated but very good value. Parking is convenient and there is easily access to the highway. Times grocery store is within walking distance as are a number of good eating spots. One thing I would definitely recusing walking to the beach and enjoy the beautiful sunset.